The road to adulthood means a constant barrage of personal challenges. For the narrator in For Two Thousand Years by Mihail Sebastian, it means beatings and name-calling by anti-Semitic thugs. The novel opens with the narrator enduring blows and threats from his fellow students. Written in 1934, Mr. Sebastian’s work focuses on his experiences in Romania between the wars. Mihail Sebastian (the pen name of Iosif Mendel Hechter) “came of age in a country in the grip of an acute identity crisis,” as Mark Mazower explains in the Foreword. Mazower, historian and author of Hitler’s Empire, continues, “Anti-Semitism was rife in Eastern Europe, but nowhere moreso than in Romania. Prejudice ran rampant across the social spectrum, from the peasantry, wont to rise up in occasional pogroms, to the royal court.” For Two Thousand Years examines this poisonous milieu and eviscerates it with the scalpel of wit. With expert precision Philip Ó Ceallaigh translated For Two Thousand Years. He has fashioned a work that toggles between voices and modes of speaking. The novel proceeds with a conversational pace, adapting the Romanian into a piece that will neither intimidate nor bore. Except for the occasional sentence in untranslated French, the translation flows with ease and clarity. It is a truth universally acknowledged that college students can be self-absorbed and self-righteous. The narrator speaks to these attributes, but complicates the caricature of youth with his intelligence, detachment, and ambivalence. Like Sebastian, the narrator is a Jewish Romanian. He argues with Marxists and aesthetes. He attends a meeting to witness Ze’ev Jabotinsky speak. Jabotinsky was the leader of the Revisionist Zionist movement. The thrust of Jabotinsky’s movement involved reclaiming the Holy Land not through legalistic wranglings but through force. The narrator is entertained, but isn’t really a joiner. In another passage he wrestles with his lack of faith. He must constantly confront the question, “What does it mean to be a Jew?” If he were a zealot, an ideologue, or devout, the answer would come more easily. Amid the political chaos and personal ambivalence, he meets the eccentric professor Ghiţă Blidaru. “Blidaru’s course rearranges hierarchies with the greatest of ease. Only a couple of words on what the textbook considers sacrosanct, then ten furious lectures on what the textbook despises most.” Through conversations with Blidaru in the professor’s apartment, the narrator abandons his course work in law and enters the architecture school. Throughout history, the Jews have been expelled, murdered, and ghettoized. Laws made them the perpetual other. Antisemitism adapted and changed with the times, from its origins in religion and then to the adoption of scientific rhetoric. The Jews were set apart and then attacked because of their apartness. The narrator doesn’t consider himself a devout Jew and espouses a non-ideological nationalism. He sees himself as a native of the Danube coast not as a creature of the ghetto. 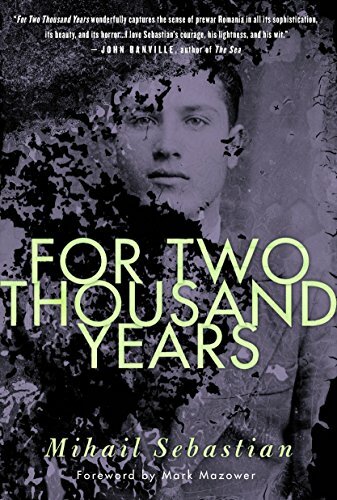 For Two Thousand Years by Mihail Sebastian is a hidden gem in European literature, shining a light on what happened in Romania between the wars. Unfortunately, Sebastian never got to write another novel. He died a victim of an automobile accident in 1946, having survived the Second World War and the Holocaust. That fatal moment robbed the literary world of a unique voice.